2. The Refundable Amount on departure. (aka the Refundable Amount or the Interest Free Loan to the operator) The 'Deferred Management Fee' leads to a view that it is paid on departure but the reality is it is paid the day the cheque is written to enable occupancy, it is included in the total entry $ price. Only one cheque is ever written, not on exit just on entry. 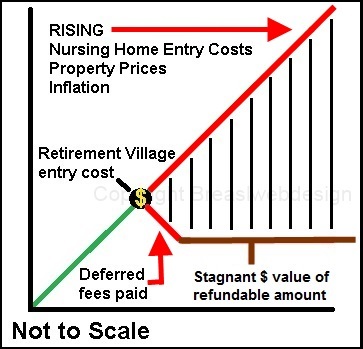 From day one of occupancy in the village the refundable portion of the deferred fee (aka the 'capital contribution') reduces each year by a set percentage until the 'deferred management fee' period expires. $400,000.00 Retirement Village Entry Price inclusive of the $100,000.00 Deferred Fee and the $300,000.00 Refundable Amount on leaving the village. $100,000.00 Deferred Fee being 25 % of total entry price . 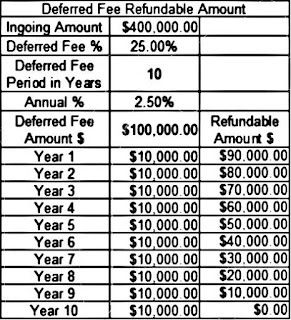 Deferred Fee Period 10 Years. 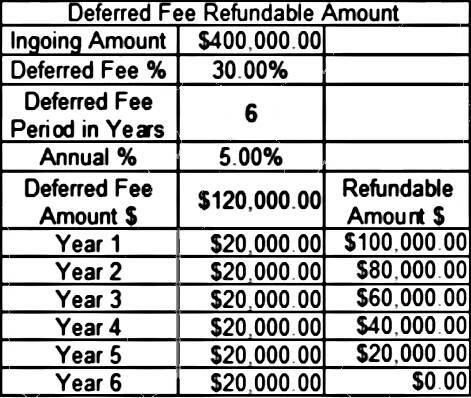 The refundable portion of the Deferred Fee reduces by 2.5% of the entry price per year until the end of the deferred fee period. 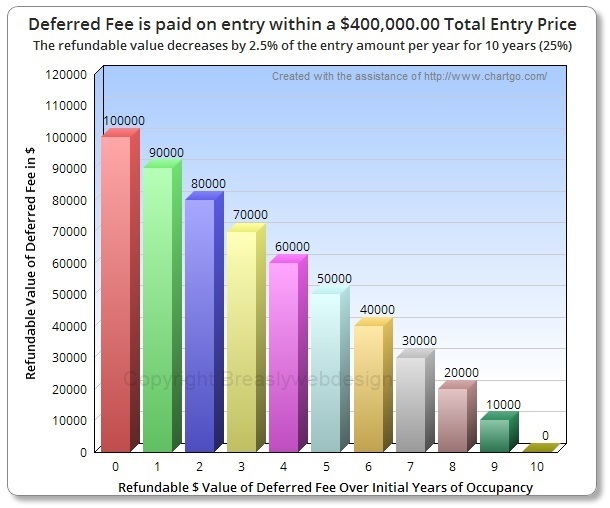 (2.5% x 10 years = 25% of Entry Price) In the example to the left the 'deferred fee' $ amount is 25% of the total entry price divided by 10 years (deferred fee period) or 2.5% each year of $400,000.00 = $10,000.00 each year for 10 years. After the expiration of the deferred fee refundable period only the refundable capital amount ($300,000.00) is left and subject to any capital gain/loss provision and exit costs is due for refund on departure. 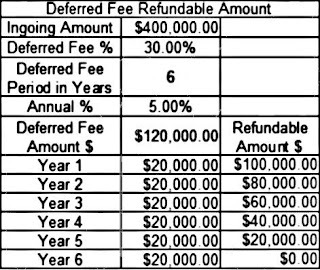 If the 'deferred fee' is 25% of the total in-going payment of $400,000.00 and the 'deferred fee' period is 10 years, then the 'deferred fee' totals $100,000.00.The refundable portion of the 'deferred fee' will be reduced at the rate of 2.5% of the total in-going payment per year over the first 10 years of your occupancy. 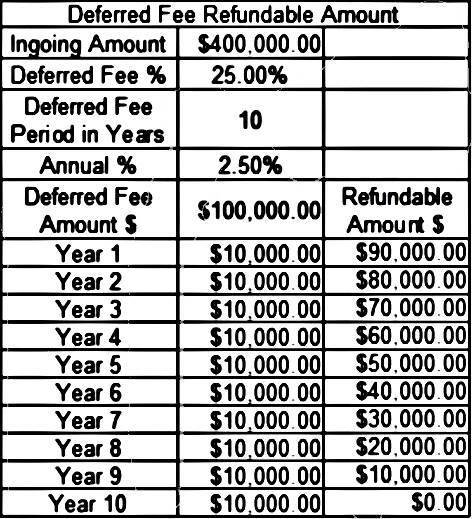 If the 'deferred fee' is 30% of the total in-going payment of $400,000.00 and the 'deferred fee' period is 6 years then the 'deferred fee' totals $120,000.00.The refundable portion of the 'deferred fee' will be reduced at the rate of 5% of the total in-going payment per year over the first 6 years of your occupancy.